Go to www.beachbodycoach.com/SARAHGLOSES and add me as your free coach by signing up for the free membership (THIS IS MANDATORY). If you do not yet own a Beachbody Program, please use the above link to go through to my shop and purchase a program for the challenge OR ask me for assistance. Ideally, you should consider purchasing the challenge pack associated with the program of interest (you will receive a month supply Shakeology with your program to aid in your journey). You must be committed to following the scheduled Beachbody workouts throughout the course of the challenge (there will be a reminder calendar posted). You must also be committed to following the nutrition plan associated with your program (or another comparable nutrition plan). It will help to track your foods using MyFitnessPal. Follow Sarah Griff-Fit on Facebook AND on Instagram (sarah_griff_fit) and add me as your friend. Once added ask me how to join our private FB group. 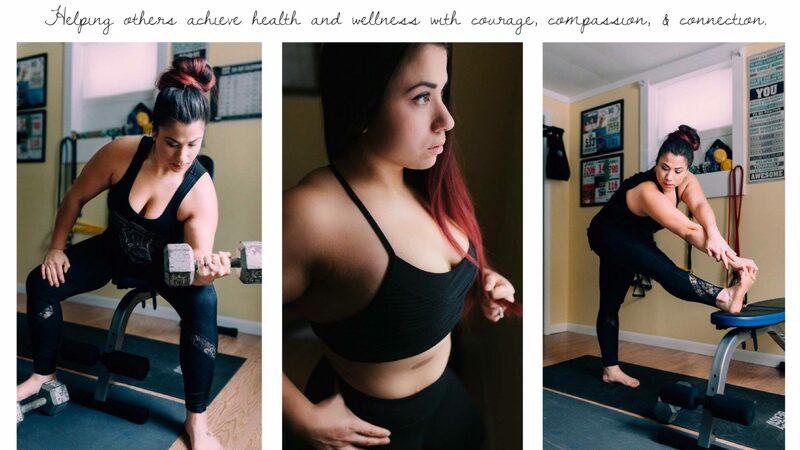 Please take a moment to fill out the form at the bottom of the page on my website (this will help me assess your goals and current level of fitness). Before/During/After Photos and Stats: You will be required to share your progress photos throughout the course of the challenge. If you are hesitant of sharing this through IG or FB that is ok—you can email them to me directly. **Note: sharing through these outlets is a way to keep you accountable and keep you motivated—I can assist with anonymous sharing as well. Before photos must be received by the 7th. Group participation *there will be a star point system for participation: You should participate in the FB group by sharing details of your daily workouts and weekly progress. You can also share recipes, meals, and your struggles and wins. 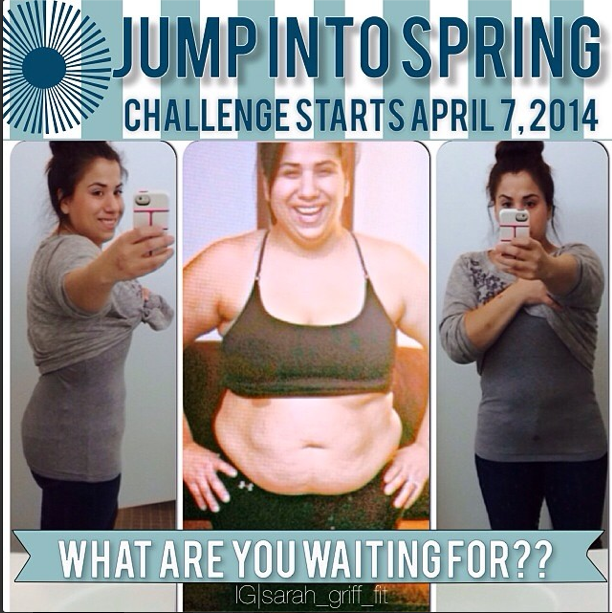 (If you are posting to IG please hashtag your daily photos with #sarah_griff_fit #jumpintospringchallenge) **Stars will be awarded for each post, bonus stars will be awarded with daily challenges—for full details on the start point system please review the files tab in our FB group. Weekly Challenge Assignments: Each week I will post an assignment for you to complete. It could be anything from drinking more water to finding a workout buddy within the group. Be sure to check pinned posts for details. What if I can’t afford the challenge pack for the program I am interested in? There are many other affordable Beachbody programs available (as low as $40) and you will be allowed to join this challenge with the purchase of ANY program (so long as you fully commit to following it each day). Do I need to use aBeachbody Program to commit to the challenge? For this challenge, yes, you will need to follow a specific program. If you choose not to follow the program you must sign-up for a month supply of Shakeology while maintaining an active lifestyle. What will my workout program be if I chose not to do aBeachbody program (option only available toShakeology users). This is fully up to you!! You just need to commit to putting in a 30-60 minute workout every day where a workout is required (and drink your Shakeology). WhatBeachbody Program is right for me? If you have questions regarding which program to choose please contact me directly and we will work on finding something that is suitable to your goals and current fitness level. Is there a way I can save on theBeachbody Programs?Shakeology? YES! When you purchase a challenge pack you can have your coaching fee waived. Coaches receive a 25% off discount on future purchases of all programs and Shakeology. If you purchase the Les Mills Combat challenge pack before the end of March you can buy it at the promo price of $140 (includes shakeology). We also have Les Mills Pump $180 and the Ultimate Reset $245 on promo until the end of March. The top 3 participants (based on over all results and level of participation) will receive gifts that are TBD.